The Dodge Durango is a versatile and efficient SUV that separates itself from the rest of the segment with immense power! This SUV offers ample passenger room with two different seating configurations, colossal towing capabilities, and menacing style that appeal to an array of families. There are five trim levels available for the 2018 model year and each comes equipped with the latest in modern features, safety equipment, and powerful engine options. We're going over each trim level below to help you and your family figure out which is the best for all your needs so keep reading! The base SXT trim level is loaded with noteworthy features that will make it a go-to for tons of families. Standard features include 60/40 split second-row seat, 50/50 split third-row seat, 18-inch alloy wheels, a seven-inch touchscreen interface, three-zone climate control, heated mirrors, a load-leveling rear suspension, cloth upholstery, keyless entry and ignition, a rearview camera, Apple CarPlay/Android Auto smartphone integration, heated mirrors, a six-speaker sound system, Bluetooth phone connectivity, and dual USB ports. This model is powered by the standard 3.6-liter V6 engine that is paired to an automatic eight-speed transmission. Together they produce 260 lb-ft of torque and 293 horsepower. Next up is the GT trim level. This model builds upon the SXT trim level with driver-position memory settings, rear parking sensors, satellite radio, a power liftgate, leather and suede upholstery, a 115-volt power outlet, heated front and second-row seats, remote start, 20-inch wheels, a heated steering wheel, and power-adjustable front seats. This model is powered by the same powertrain as the SXT model. Opting for the Citadel model gets you even more features! They include an 8.4-inch touchscreen interface with Uconnect, a power-adjustable passenger seat, front parking sensors, ventilated front seats, a navigation system, upgraded brakes, a nine-speaker audio system with HD radio and subwoofer, additional leather trim, enhanced leather upholstery, a power adjustable steering column, automatic windshield wipers, xenon headlights, a sunroof, automatic high beams, roof-rail crossbars for additional cargo room, a cargo cover, and additional leather trim. This model offers an Anodized Platinum appearance package which adds special interior trim, and exclusive leather upholstery with silver accent stitching. This model is also powered by the standard powertrain option but offers the choice to upgrade to the 5.7-liter V8 engine. The R/T trim level comes equipped with a premium Beats audio system, an upgraded steering system, a sport-tuned suspension, red accent stitching, an upgraded steering system, a performance hood design, and LED fog lights. A sunroof and roof rails are optional for this trim level too! Underneath the hood, you'll find the 5.7-liter V8 engine working with an automatic eight-speed transmission. 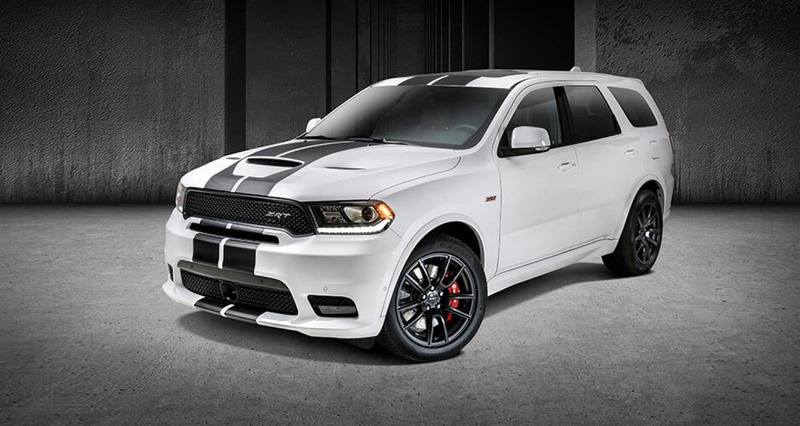 The top SRT model takes the Durango's performance capabilities to a whole new level. Features include SRT Performance Pages, a performance-tuned suspension, an electronically controlled limited-slip differential, and an adaptive suspension. This model is powered by a 6.4-liter V8 engine that works with the eight-speed automatic transmission and they put out 470 lb-ft of torque and 475 horsepower. If you opt for the SRT model you also get access to a driving school with SRT Track Experience. There are tons of packages available (depending on the trim level that you opt for) so you can create the perfect Durango to meet all your family's needs. Some of those packages and features include black running boards, a dual-screen rear entertainment system, a Blacktop package, a Brass Monkey appearance package, a 12-volt power outlet, a trailer tow package, and driver assistance features. The 2018 Dodge Durango is perfect for families that are looking for more power and style than your average SUV can provide! Check out our current Durango inventory right here to see if your perfect model is in stock then give our sales department a call to learn more about it and see it in person!